This topic describes how Pivotal Cloud Foundry (PCF) operators can deploy NFS volume services. A volume service gives apps access to a persistent filesystem, such as NFS. By performing the procedures in this topic, operators can add a volume service to the Marketplace that provides an NFSv3 filesystem. Note: You must have an NFS server running to enable NFS volume services. If you want to use NFS and do not currently have a server available, you can deploy the test NFS server bundled with the NFS Volume release or enable NFS volume services with the NFS Broker Errand for Pivotal Application Service. You can enable this errand during PAS configuration. Use Application Security Groups (ASGs) to prevent apps from sending traffic directly to your NFS ports. Apps should never need to use NFS ports directly. Pivotal recommends defining an ASG that blocks direct access to your NFS server IP, especially ports 111 and 2049. For more information on setting up ASGs, see Application Security Groups. In addition to ASGs, LDAP secures the NFS volume service so that app developers cannot bind to the service using an arbitrary UID and gain access to sensitive data. With LDAP support enabled, app developers must provide credentials for any user they wish to bind as. 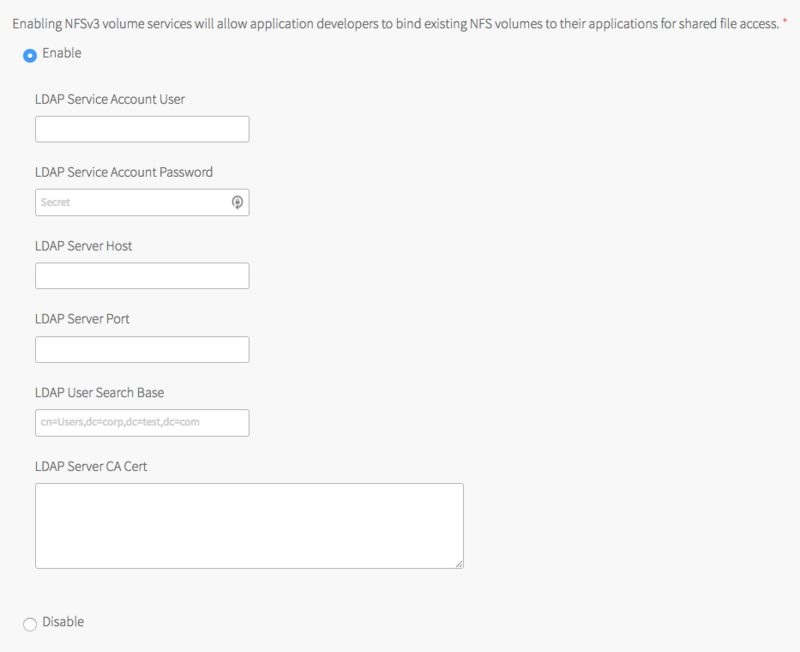 Under Enabling NFSv3 volume services, select Enable. (Optional) Enable access to the nfs-experimental service. See NFS Volume Service for details about the differences between the two nfs services.